Took highway 14 from Huron to Pierre. Got an early start, hitting the road just a little after 6. Winds were lower in the morning, then picked up as the morning progressed and stayed strong until the late afternoon. Road was good for biking, with a few exceptions that were still passable. I met another biker named Nathaniel in Blunt, about 25 miles from Pierre. More on him later. 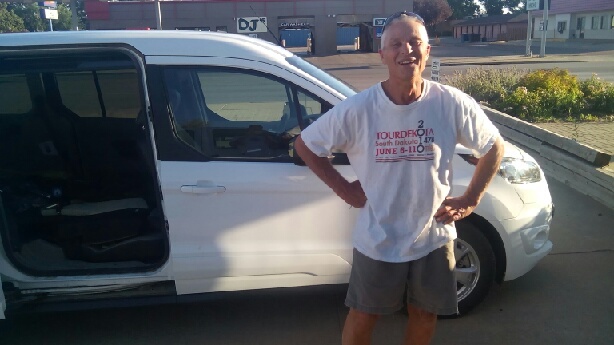 His rear tire blew as we were arriving in Pierre, so we walked to the local bike shop. Unfortunately, it was closed Sunday (today) and Monday. After some frantic internet searching, I find the contact for the local bike club, the Oahe Wheelmen. Randy was very excited to help us out, and met us at subway with a pair of tires for Nathaniel and helped put them on. Randy had previously worked as a biking guide in the black hills area. Thanks so much Randy, for your generosity, advice, and stories. Always happy to assist a full-timer regain mobility. Hope the tires work for Nathaniel. Lots of adventures ahead of you two so ride smart, be safe and enjoy your youth. Here's the contact info for my book on trekking to Everest Base Camp with 18-time Everest summiter Ang Dorjee Sherpa and my friend World Famous Travel Writer Tim Cahill. Stay in touch, we're headed west next week only via 4, not two wheels. A portion of the proceeds from the sale of each book goes to the sherpas in Phortse Village, Nepal.